I learned how to knit as a kid, but then knitting sat on the back burner for about twenty-five years before I took it up again. I’m really glad it had a revival in my life, because there’s so much I love about knitting. The colors, textures, warmth, and beauty of yarns. The variety of projects, patterns, and stitches. The community that gathers at my wonderful local knitting store, where people share patterns, joys, sorrows, and news to the gentle clicking of knitting needles. My rhythmically moving hands. Watching stitches form into a perfect pattern. I’ve used knitting with a few art therapy clients over the years and I think they’ve felt some of the kinds of benefits mentioned above, particularly the tactile, rhythmic, meditative comfort knitting offers. 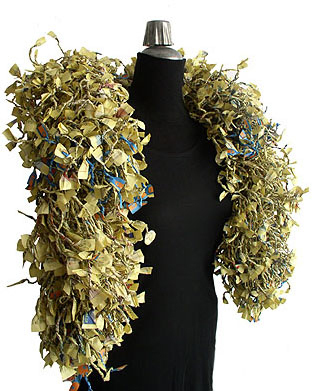 For those also into knitting and/or recycled art, here’s a knitting artist to inspire you. Ivano Vitali spins yarn out of recycled newspaper and knits up gorgeous garments and wall hangings on huge needles. Black Bijou (2011) is a cardigan and skirt outfit. The cardigan is knitted with black ads and has a white edge crocheted with newspaper in a daisy motif. The transparent skirt is made with the black edges of the newspaper. Boa (2005) was knit from the yellow pages. This entry was posted in knitting, meditation, recycled and tagged ivano vitali, newspaper on January 12, 2014 by Helen Ellis.